●2010年5月14日にエマちゃんから返事が届きました。ファンレターを送った日にちは不明です。同封されていたのは、前回↓と同じポートレートと手紙でした。〜ユウキさんからの情報です。Thanks! [posted at JST 5/20/2010 ポッターマニア 無断転載禁止]NEW! 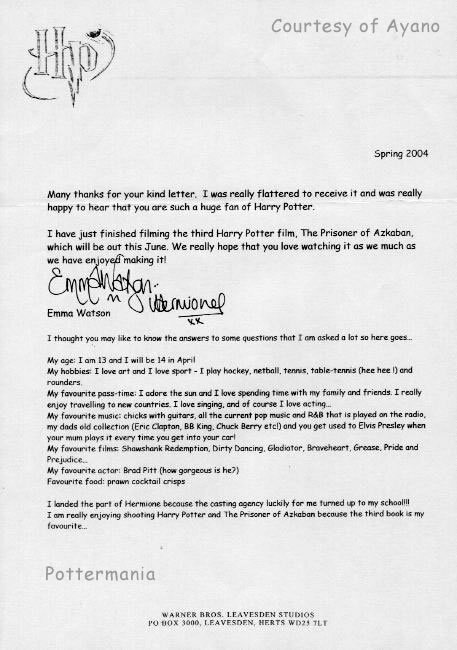 The purpose of this letter is to say a big thank you for the really lovely letter you sent to me. It was great to receive it and the time you spent writing it means a lot to me. Well after nine months away, I am now back at the studio as we have started filming 'Harry Potter and the Order of the Phoenix'. I can't believe how quickly this last year has gone! I have been back at school, studying hard for my GCSE's, catching up with friends and family and playing lots of hockey... and now the countdown to my exams really begins-June is approaching a little too quickly for me! I keep reminding myself of how gerat it will feel once they are over and I get to put my books away for a short time — not very Hermione I know! For now though, my studies are running side-by-side with filming and it is really good to be back on Harry Potter. Obviously, I miss all my friends at school and the life I have built while I have been away, but I am so excited about this film that it makes it a little bit easier to be away from them all. This film feels fresh and new as everyday I am introduced to new cast members and crew. Best of all is a new approach to the script from director, David Yates, who I feel I have learned something from already and we're just a short time into shooting. This year I will be back to my usual Hermione self —lots of running around, some stunts here and there and lots of being thrown around! Anyway,I better go and get on with some schoolwork!